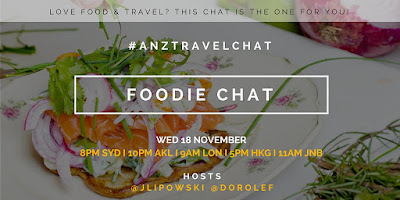 Have you heard of the Australia and New Zealand Travel Chat on Twitter? In short that is the #ANZTravelChat. Having lived in Australia for seven years, I am so happy to connect with these guys. This week the chat is all about food. What else? Australians are so very obsessed with everything food related, there is always talk about the hottest restaurants, new bistros or pubs, and of course about where to get the best espresso based drinks. 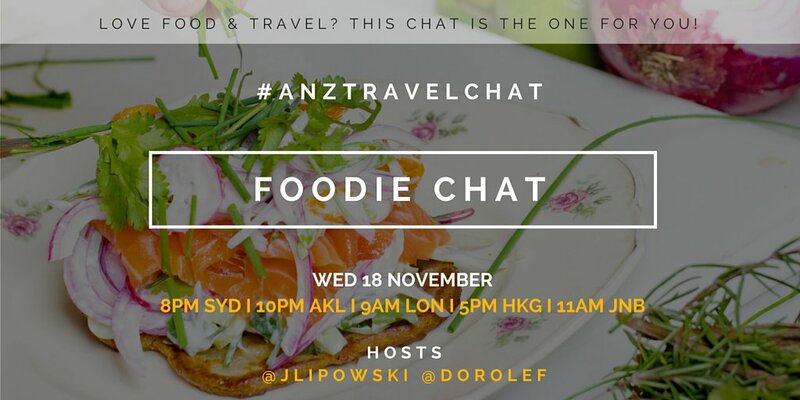 Join Jessica Lipowski (meet her here as an eyewitness of Amsterdam, The Netherlands) and the rest of the Australia and New Zealand Travel Chat Community on Wednesday, November 18th at 9am Berlin / 8pm Sydney / 10pm AKL / 5pm HKG / 11am JNB to talk about glorious food. Jessica works on a book about 66 immigrants in the Netherlands that own a restaurant in Amsterdam. Jump onto Twitter, use the hashtag #ANZTravelChat and look for Jessica and Dorothée. Come as you are, we can’t wait to meet you in the Twittersphere. Why not connect with founder Saxon while you are there?